MultiBrief: Cognitive offloading: Help or hindrance? Cognitive offloading: Help or hindrance? Roughly two-thirds of Americans (68 percent) have smartphones, and nearly half (45 percent) own tablet computers. Such devices tell us the time, date, sunrise, sunset, weather, what we need to do, when we need to do it and how we can get there. We can sync our calendars as well as our grocery to-do lists on all our devices. We use technology to carry out even the simplest of tasks. Instead of writing, we type. Instead of using our mental math skills, we use a calculator. As an extension of our brains, these electronic devices help us to be faster and more efficient. They save us from needing to remember and reduce the effort necessary to perform a mental task. But are all these devices contributing to a weak memory muscle? Memory is of such critical importance to our very existence. Like most of the brain's processes, memory remains a bit of a mystery. We often talk about memory as a single thing, when, in fact, it's a congregation of several complex processes. As such, managing incoming information is also a complex function, involving the limbic system — the hippocampus, amygdala, cingulate gyrus, thalamus, hypothalamus, epithalamus, mammillary body and other organs, many of which are relevant to the processing of memory. According to Evan F. Risko, a Canada Research chair in Cognitive Psychology at the University of Waterloo, and co-author Sam Gilbert, a Royal Society research fellow at University College London, if we program a smartphone to remind us of an upcoming appointment, we have engaged in "cognitive offloading." This means we are using physical action to alter the information processing requirements of a task to reduce cognitive demand. We write appointments down and set reminders with our smartphones or tablets, eliminating the need to use our internal cognitive abilities because we think we are being more efficient or simply because we are on mental overload. Offloading may helps us get more done faster, but storing information on our smartphones, computers or tablets may cause us to become reliant on them, ultimately affecting how we remember. To test this theory, Risco and Gilbert sent participants off to a museum equipped with digital cameras. What they discovered was that taking photographs of objects degraded participants' abilities to remember what they saw compared to the objects they didn't photograph. In an earlier study, when participants took a photo of each object as a whole, they remembered fewer objects and fewer details about the objects and the objects' locations in the museum than if they only observed the objects without photographing them. When participants zoomed in to photograph a specific part of the object, their subsequent recognition and detail memory was not impaired. In fact, memory for features that were not zoomed in on was just as strong as memory for features that were zoomed in on. Risko and Gilbert plan to focus on the way offloading changes the way we think in addition to what's happening in the brain when we offload. They are also interested in the long-term consequences of living in busy, high-tech environments that encourage us to constantly offload our cognition. 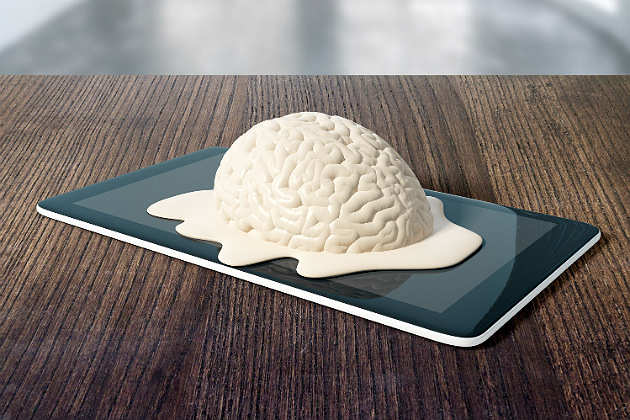 According to Risko, there is much discussion about whether devices like smartphones are ruining us cognitively, but research addressing the long-term cognitive consequences of offloading to a variety of devices is limited at this point in time.